Since the August Newsletter the Footpath Maintenance Working Party has met four times. We have worked on paths in Blackrod, Egerton, Horwich and Worsley and also paths in the Montserrat area of Bolton. The paths, Worsley 154 and 102, are actually in Salford but go very close to the Bolton boundary and their maintenance is the responsibility of Bolton Council. We worked on these very over grown paths in June/July 2017 and returned to them in October 2018. A much easier task this time but the brambles had grown sufficiently vigorously to make the path impassable. I was determined to make sure these paths were actually walked so my contribution to Bolton Ramblers Boundary Walks took us along Worsley 154 and 102. To get an idea of the work we did on the Worsley paths, the photographs below show the "before and after" affects of our work. Finding suitable paths to work on is a very time-consuming task because there are only a few people who reports paths needing attention. 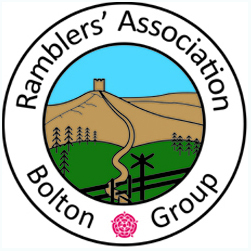 When you are out walking around paths of Bolton, it would be very helpful if you would report paths that we might be able to work on by emailing Bolton Ramblers at boltonramblers@hotmail.co.uk. Volunteers are all members of the Ramblers Association, and are insured by the RA. We meet once a month for 2 hours on Tuesday mornings and aim to make a difference to our wonderful footpath network. 2019 Maintenance Dates - All Tuesday dates - March 12th, April 9th, May 7th, June 11th, July 9th, August 13th, September 10th, October 8th, November 12th. You must be a member of the RA in order to participate.